Here in Phoenix, summer is nearly upon us, and soon we will all be on fire. So naturally, this is the time of year when thoughts turn to staving off immolation however possible, and the Naeng Myun at Café Ga Hyang — chilled Korean buckwheat noodles served in an icy cold soup — is as cool and refreshing as savory meals get. 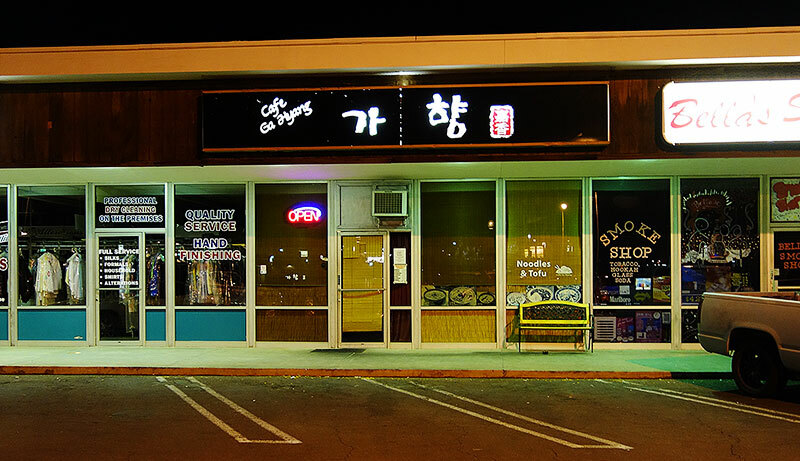 Ga Hyang is buried in the corner of a Glendale strip mall, sandwiched between a dry cleaner and a smoke shop, and while its environs may be typical when compared to so many west side ethnic gems, the pair running the place are anything but. Korean-born Sun Johnson, who previously owned and operated multiple Korean restaurants in Texas, first encountered Nick Rocha when he came to work with her at another local Korean restaurant — his first kitchen job, and first encounter with Korean food. Despite his inexperience, Nick showed an affinity for the kitchen, a natural talent for discerning flavor, and an enthusiasm for the cuisine that impressed Sun, and before long the two had teamed up and set out to open their own restaurant. 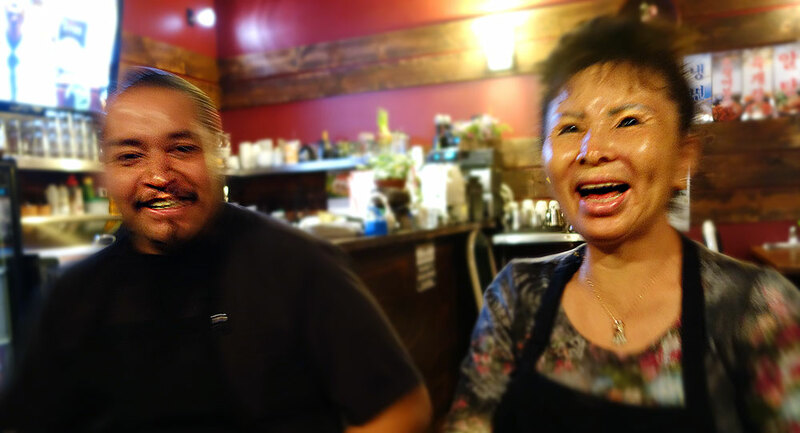 They took over Café Ga Hyang in 2011 and promptly revamped the menu, dispensing with almost all of the Korean-Chinese dishes and installing a long list of Sun’s recipes, which she has taught Nick to prepare. These days, Nick mostly holds down the kitchen during service, occasionally emerging to take a break on the bench out front when business slows down. Meanwhile, Sun bounds around the dining room like someone thirty years her junior, coaching diners on banchan pairings one minute, extolling the myriad health benefits of Korean ingredients the next (all of Sun’s food is healthy… all of it). Open from 11 am until 2 am every day except Sundays (when they close at 11), it was only last month that they finally decided to start taking Mondays off, making them not only one of the least probable pairs of business partners in Phoenix, but also one of the hardest working. What they’ve built inside this strip mall space is a comfy, welcoming home where you can sit in low light, relax with friends, watch a little Korean television, and share some outstanding food. But it doesn’t take long to grasp that they have an even greater mission, which is to cook the food how it’s meant to be cooked, and educate the residents of the Valley about the incredible flavors (and health benefits) that Korean cuisine has to offer. Which means that while they’re always happy to sell some bibimbap, bulgogi, or japchae, they’re especially thrilled when non-Korean customers get excited about a dish like naeng myun. Naeng myun (also naengmyeon) means, simply, cold noodles, and though there are infinite varieties, regional variations, and personal spins, naeng myun mostly falls into two primary categories: bibim naeng myun, and mul naeng myun. Ga Hyang serves both, the former being chilled buckwheat noodles tossed with meat, vegetables, fruit, and a sweet and spicy sauce. But mul naeng myun — which they list on their menu simply as “Naeng Myun” — is a little less aggressive, instead sending the noodles to swim in an icy cold beef soup. Mul naeng myun originated in the Northernmost regions of Korea, where Mongol invaders introduced buckwheat to the country (upsides and downsides, you know), but it wasn’t widespread until after the Korean War, when northerners brought the dish with them as they migrated south. Sun hails from Ulsan, a southeastern coastal city, and though it doesn’t have nearly the history with naeng myun as northern cities like Pyongyang and Hamhung, Sun recalls it being a popular dish where she grew up, enjoyed equally in the hot summers and cold winters. The noodles — thin and dark brown — are made with buckwheat and starch, and their character is primarily determined by the ratio between the two. More buckwheat and less starch, and you get a firm but yielding noodle similar to Japanese soba. More starch and less buckwheat, and you get a sticky, elastic noodle that resists breaking (not to mention chewing). It’s the latter that Ga Hyang serves in their clear beef soup, along with traditional accompaniments like cucumbers, nashi pear, brisket, hard boiled egg, mustard, and the occasional non-traditional touch. Making Ga Hyang’s naeng myun is a deceptively laborious task, starting with a stock pot the size of a dishwasher, where they make yook soo, the beef broth that’s the soul of the dish. It’s a little unfair, really, to call it beef broth. When Sun and Nick start talking about what goes into the soup, it’s almost like a well-practiced routine where they take turns rattling off a grocery list of ingredients, starting with beef bones and whole chickens, moving into basic aromatics like onions and ginger and garlic, and continuing on to include what seems like at least a dozen different vegetables and seasonings, none of which are artificial or pre-made. It’s not just a fact but a point of pride with these two, that while it makes for a much more difficult job, they’re unwilling to compromise on the quality of their stock. MSG = Fighting Words. When it’s time to make the dish, Nick pulls an assortment of chilled items out of the refrigerator, including nashi pear, pickled daikon radish, cucumber, thinly sliced beef brisket, and a hard boiled egg. He slices the egg and cucumber, then turns his attention to the noodles, which go for a quick bath in boiling water — just a couple of minutes — before being thoroughly rinsed under cold running water, chilled in an ice bath, and wrung out like a dishtowel. The noodles are transplanted to a chilled metal bowl, the toppings are added, and Nick pulls out the stock, which has been mixed with a bit of the daikon’s pickling liquid and frozen before being halfway thawed, so that when it emerges from the cooler it’s clear and dark and slushy, if not downright icy. The entire dish is bathed in the frigid broth, and it’s sent to the table with a bottle of hot Korean mustard that Sun makes from dried, powdered seed. When the dish hits the table, it’s not quite ready yet. First, it gets a squirt of the hot mustard, and then come the ubiquitous Korean kitchen shears, which Sun will use to make the noodles manageable (some eat them whole, but I’m at a loss to understand how). She then gives the dish a quick stir, and it’s all yours. Diving into this dish is like dunking your head in an ice bath — it’s crisp and clarifying and oh so cold. The namesake noodles aren’t even immediately evident, lurking beneath a slushy layer of broth, difficult to separate from one another, and almost alive as you eat them. These noodles fight back, and while the struggle is unexpected and a little shocking upon first try, it quickly reveals itself to be a rewarding experience. The toppings are juicy and crisp, lending a light crunch to the noodles’ squish, and the cool sweetness of fresh fruit. When in season, Sun and Nick sometimes swap sliced watermelon for the nashi pear. It was a substitution borne of necessity that worked so well they now choose to do it even when they don’t have trouble getting a hold of good nashi pears. It’s a brilliant little signature twist, providing not only an unexpectedly delightful flavor pairing, but a beautiful splash of color. 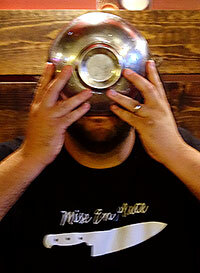 It’s when you get into the soup, however, that the dish fully comes together. The broth is remarkable, made sweet and sour by the daikon pickling liquid, perked up with the mustard’s earthy, stinging heat, but underneath it’s an immensely flavorful, deeply layered stock with the kind of silky richness that can only be achieved with bones, and bones, and more bones. It is soulful and delicious, and the effort that goes into it is not wasted. Getting all of these elements together — cold upon ice upon crisp upon chilled upon frigid — creates an dish that can make a 120° afternoon in Phoenix feel like a crisp Fall morning in Vermont. The naeng myun is extra good when paired with kalbi, and in fact the two are also offered on the menu as a combo. The hot, smoldering, charred beef short rib provides a bracing temperature contrast, and their flavors were made for each other. Whether paired with the kalbi or not, for the good of the public it must be said that this is how you finish a bowl of Ga Hyang’s naeng myun. It may earn you a sideways glance from a diner who doesn’t know any better, but it will earn you nothing but respect from those who are preparing your meal. Nick will all too sadly relay horror stories of customers munching on the toppings and slurping up all of the noodles, only to leave a bowl of the broth behind. It is acts like these, innocent and ill-informed though they may be, that drive many a cook into a murderous rage. But for Nick, it only serves to reinforce his and Sun’s mission — to show Phoenix how wonderful these dishes are, what it is that makes them so, and above all to educate, even when somebody who doesn’t know any better abandons a bowlful of your beautiful, beautiful broth. Café Ga Hyang is located at 4362 West Olive Avenue, in Glendale, Arizona 85302, and on Friday and Saturday nights you will know it by the caravan of oversized pickup trucks parked out front, overflow from the country bar a few doors down. Their number is 623-937-8550, though other than Mondays, when they’re closed, it’s always easy to walk in, and they’re probably up later than you. Duk Boki (rice cakes in a fiery sauce), Haemul Pajeon (a crisp seafood and vegetable pancake), and any of the soups are essentials. As is — much as I’m shocked to admit it — the Kung Pao Chicken or Shrimp, which may be the very best non-Chinese Chinese dish you will ever taste. And if Sun tells you what to eat or how to eat it, do yourself a favor and listen to her. This entry was tagged brisket, cold, Korean, noodles, soup. Bookmark the permalink.